Welcome to Mantecón Studio! My name is Lauren Mantecón. I am an artist who has been experimenting with paint and mixed media material for over twenty years. Being both a painter and an educator who loves the artistic collaboration, I opened Mantecón Studio in 2014 so I could share my art-making with others. You may view my paintings at LaurenMantecon.com. I provide my students with a variety of techniques and inspirations, regardless of background or experience. We explore hands-on techniques that include mark-making, pastels, paint, collage, wax, and dry pigments all in combination. Generating ideas and visualizations are provided to spur the imagination. Come experiment and play with an open mind and leave with a beautiful piece of work. 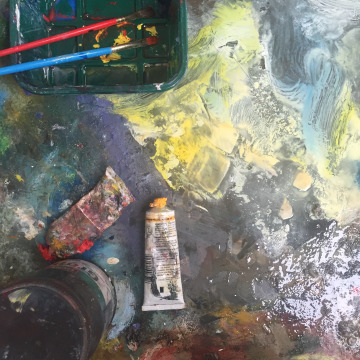 The studio, located at 123A Camino Teresa in Santa Fe, NM, offers personalized classes, a once weekly open studio, and a variety of featured workshops. Whether you're a Santa Fe resident, or just here for a visit, Mantecón Studio has something for everyone. 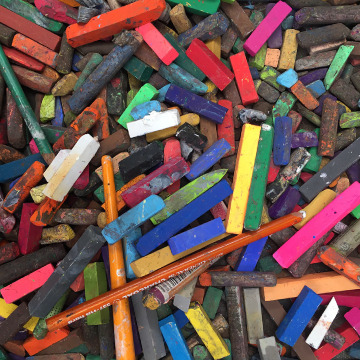 For participants at any level who prefer a more structured art making experience. Lauren provides individualized attention and the opportunity to explore and gain confidence with acrylics, oil, and mixed media. Classes are scheduled at your convenience. Whether you’re a seasoned professional or new to making art, the studio doors are open Wednesdays from 1:30 - 4:30 pm. Come explore your creativity with other like-minded people, and paint alongside Lauren in a bright, inspirational space. All materials and some instruction provided. The studio now offers a variety of different workshops taught by Lauren, as well as other visiting artists. Color theory, large scale painting, and book arts are just a few examples of what you will find here. Check back often—we are always adding new workshops to the menu! Make learning more accessible. Video tutorials offer new information and skills to foster your creativity and bring fresh techniques to your artwork. All videos are available for purchase and may be viewed at your convenience. Enjoy lessons on creating from the ground up. Dry/wet, handmade gesso and more.